According to a recent survey independent business owners use more tablet than the laptops or desktops. The survey was taken from over 1100 respondents and was conducted by The Small Business Authority. The survey suggested that 55percent of the business owners expected to use tablets or other such devices in the future, and currently about 28 percent of the small business owners own their own tablets to run business applications while that number dropped to 19 percent for laptops and 17 percent for desktops. And if these owners were given the choice to buy a new device than 45 percent of them will go for a tablet while 41 percent will go for a new laptop and just 14 percent will go for desktops. According to TSBA president and CEO, Barry Sloane, they are surprised about the fact, however are focused on the growth of the tablets as a tool of independent business owners. Again according to some estimates done by Forrester Research recently, a quarter of all computing devices used for work globally are tablets and Smartphones put together. 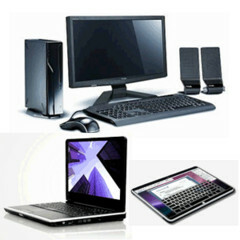 But laptops still hold 26 percent of the share and desktops taking about 37 percent of the share.